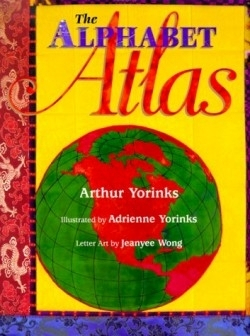 The Alphabet Atlas is an ingeniously crafted work designed to introduce preschool aged children to the facts and wonders of selected countries around the world. The book is arranged alphabetically with basic separate entries highlighting a specific detail and/or fact about a country whose name begins with the appropriate letter of the alphabet. The text is simple and easily understandable when used for the age group it was intended. The individually quilted panels of nationally known quilter and illustrator, Adrienne Yorinks, however, are more complex in nature and will require adult assistance to ensure the child’s understanding of the country depicted. The illustrator “hides” a variety of country -specific facts within the fabric of the material used to quilt the countries illustrated. When available Yorinks used fabrics indigenous to the country to quilt that country’s panel; and sewed onto the panel’s border various animal and/or craft motifs that makes that country different. Such crafting provides invaluable hours of storytime enjoyment.